Main Street Birmingham (MSB) got some several pieces of great news in recent days involving the Nixon Cultural Center project in Ensley will be able to move forward. 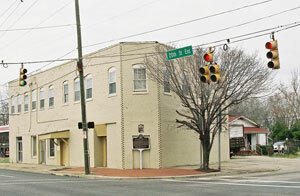 The National Trust for Historic Preservation has awarded MSB more than $4,700 in matching grant funds to be used for future development of the former NAACP meeting space in Tuxedo Junction. The money is from the National Trust’s African American Preservation fund and it will be used to assist in planning for the project’s completion and sustained operations. They also just received word that the Alabama Historical Commission Review Board approved the Nixon Building’s nomination to the National Register of Historic Places clearing the way for National Park Service approval. All of this news follows last fall’s $7,000 grant from the Alabama State Council on the Arts. Photo: The Nixon Building. Courtesy of MSB.